Myopia – or nearsightedness – is becoming more widespread and is expected to become even more prevalent, possibly because people are spending longer periods on tasks using near vision, such as reading and using electronic devices. Myopia is the most common refractive error in SA and it’s normally simply an inconvenience that results in blurry vision when looking at objects in the distance. But there are instances where the condition is progressive and severe, and can result in severe visual impairment. The most common treatment is correction with glasses or contact lenses. Many people opt for laser refractive surgery, while other treatment involves wearing special contact lenses to reshape the cornea, or having intraocular lenses surgically implanted in the eyes. It’s essential that you and your children have your eyes checked at least every two years, or if you have difficulty seeing distant objects or experience squinting, eye strain and headaches. A person with Optic Nerve Hypoplasia (ONH) has small eye nerves (optic nerves) from the eye to the brain. Some people with ONH also have an abnormal brain and a poorly functioning pituitary gland. The attached brochure explains the problems that can occur in children with ONH. Your child may have none, any, or all of these problems in a mild or more serious form. Depending on the person’s problem sometimes the disease is called Optic nerve Hypoplasia (ONH), septo-optic dysplasia, or De Morsier’s syndrome. Refractive errors are a set of eye conditions that occur because of an irregular eye shape which affects the way light is focused in the eye- these conditions result in blurry or distorted vision. There are three different types of refractive errors, namely myopia/near sightedness (close up sight is normal, but distant objects are blurry), hyperopia/ farsightedness (objects at close range are blurry, while distant objects are not) and astigmatism where your vision is blurred at all distances. According to the WHO website (Resnikoff et al: 2004), uncorrected refractive errors account for 18.2% of global blindness, making it the 2nd biggest cause of blindness worldwide. As refractive errors are hereditary, people with a family history of a refractive error are at risk of having the condition themselves. Eye injury as well as certain ocular disorders, like keratoconus, can put a person at risk of developing a refractive error. Diagnosis and correction of a refractive error is quite quick and simple. Blindness as a result of this condition is avoidable if the condition is corrected, which is why it is important that every person have an eye examination at least once every two years. Refractive errors can be corrected through the use of glasses, contact lenses or refractive surgery. Corrective measures are relatively cheap and readily available. Cataract is a gradual clouding of the eye lens, leading to blurred or dull vision. The eye condition can however be corrected through surgery. According to statistics from the World Health Organisation (WHO) website (Resnikoff et al: 2004), cataract accounts for 39.1% of global blindness, making it the largest cause of blindness worldwide. Age – the older you get, the higher your chance of developing cataract. As with many other eye conditions, the effects of cataract can be slowed down and reversed with early detection –a comprehensive eye exam is necessary at least once every two years. Good nutrition, in particular, eating foods rich in antioxidants, can help slow the progress of cataract. Wearing protection(such as sunscreen, sunglasses and a wide-brimmed hat) whilst in the sun can prevent future development of cataract. Surgery is the only way to treat cataract. Age-related macular degeneration (AMD) is a degenerative retinal disease that affects the macula of the eye resulting in a progressive loss of central vision. According to the WHO website (Resnikoff et al: 2004), AMD accounts for 7.1% of global blindness, making it the 4th biggest cause of blindness worldwide. Age – the older you get, the higher your chance of developing AMD. A new treatment is available for “wet” AMD whereby an anti-angiogenic is injected into the eye to slow the formation of new rogue blood vessels which can cause sudden and dramatic vision loss. A regular eye examination, at least once every two years, will allow for early detection of AMD. A healthy diet with an increase in zinc and antioxidants will significantly reduce your risk of developing advanced AMD. People with diabetes are at risk of developing diabetic retinopathy, which is a disease of the blood vessels in the retina of the eye. According to the WHO website (Resnikoff et al: 2004), diabetic retinopathy accounts for 3.9% of global blindness, making it the 6th biggest cause of blindness worldwide. People who are at risk of developing diabetic retinopathy are those with diabetes –type 1 and 2. Everyone with diabetes should get a comprehensive dilated eye exam every year. Diabetics should have their blood sugar levels, blood pressure and cholesterol under control by maintaining a healthy diet and sticking to their treatment plan. Eliminating risks that are known to damage blood vessels, such as smoking, will help prevent the onset of diabetic retinopathy. Diabetic retinopathy is treated with laser surgery (scatter laser or focal laser treatment) or with a vitrectomy (surgical procedure). Glaucoma is a treatable eye-condition that arises from an increase of pressure in the eye. 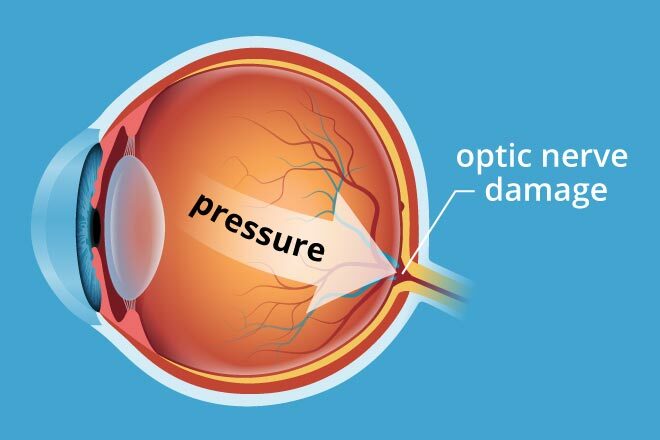 Increased pressure can damage the eye’s optic nerve and cause vision loss and eventually, blindness. According to the WHO website (Resnikoff et al: 2004), glaucoma accounts for 10.1% of global blindness, making it the 3rd largest cause of blindness worldwide. Those people who are over the age of 60 – chances of developing glaucoma increase as we age. Prevention is always better than the cure – a comprehensive eye exam at least once every two years is strongly advised. Treatment of glaucoma can include medicines(eye drops or pills) and surgery (laser or conventional) or a combination of both medicine and surgery. Conjunctivitis is often called pink eye and is inflammation or infection of the membrane lining the eye and eyelids (the conjunctiva). Treatment of conjunctivitis depends on the cause, but is usually effective if treated timeously. Good hygiene can help its prevention and re-infection: such as keeping your hands away from your eyes and diligent hand washing; changing pillow cases frequently; not sharing eye cosmetics, towels or handkerchiefs; and proper handling and cleaning of contact lenses. And be careful when you have fever blisters, as touching your eyes after contact with a fever blister can give you pink eye! Contact the Bureau for the Prevention of Blindness for more information.